Mars is energy, action and desire; the animal instinct. Unlike the Sun, which is the embodiment of creative energy, Mars is raw energy. Its divisive, scattering energy in an outward direction. It represents how a person goes after their goals, their drive and energy, their initiative, courage, and combativeness. Its aggressive and aids our survival. Angry? That is Mars coming through. Mars takes risks, even if they may cause divisions or feuds. Courage belongs to Mars, and Mars revels in lively competition. 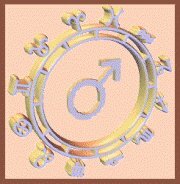 Associated with masculine energies, Mars is the life force, the chi. It fights to survive and rises to meet any challenges along the way. On the negative side your Mars Sign can spell trouble. It can show areas where you may be argumentative, pick fights, and even get violent. When positive, your Mars Sign energizes the passions so you can meet your goals. This planet gives momentum and flow. Given a good outlet, Mars can accomplish anything. When stifled, Mars will boil under the surface until it finally breaks free as anger, temper tantrums or constant irritability. Mars is often described as passionate, determined, motivated, impulsive, angry, intense and ambitious. These attributes can come in every range of the spectrum, from mild to extremely intense. This is what fuels Mars to succeed, to put themselves first, and to achieve their goals. Mars drives a person to do almost everything, from getting up in the morning to getting that promotion to the person lost in the snowy mountains who finds the fortitude to find a way to civilization. Often attached to the ego, Mars is fairly straightforward and simple. It wants what it wants, and goes out to get it, end of story. Mars goes into retrograde for approximately 11 weeks every 25 months or so, and when this occurs in a chart, there can be problems. Instead of sending energy outwards to achieve their goals, Mars in retrograde must turn inwards to find their motivation. A good example of this phenomena is Sigmund Freud, the father of modern psychoanalysis. He was born with Mars retrograde in Libra. This lent passion to his lifelong study of his own and others' motivations and sexuality.